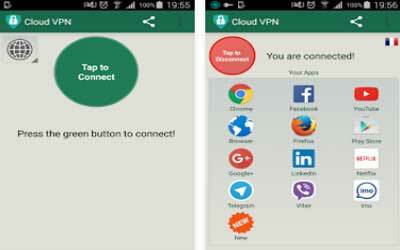 Cloud VPN (Free & Unlimited) APK 1.0.4.2 is an application to bypass all blocked website. In some countries, several websites are forbidden. In certain high school the Wi-Fi is not allowing the user to open certain social media website in order to make the students focus on their study. However, live without social media is boring. This Cloud VPN (Free & Unlimited) allows you to open those websites. If you happen to face that problem in your school, all you need to do is install this app. All you need to do is establish connection with a single tap, and you are ready to access any blocked website. You might wonder how this amazing application works. This application acts as an internet proxy. It is not only works with Wi-Fi connection, but also 4G, 3G, as well as other mobile data carriers. You do not have to be worried about your information security. It hides the IP address of your device. Therefore, you can browse the internet anonymously and privately. All you need to do is a single tap on the application to establish connection. Root access is not required for this application. Further setup or configuration is not necessary as well. The interface is user-friendly, so you can use it easier. Obviously, there are various similar applications on Google Play Store. However, this application does not obstruct the interface by disturbing advertisement. When you open and install this bypass application to your smartphone, you can see that it runs smoothly. Moreover, this amazing application able to connect faster compared to other application. The other notable thing about this application is that it does not incorporate in-app purchases. It means you can use this application for free. If you want to download and install this application all you need to do is go to search bar on Google Play Store. You can found Cloud VPN for Android under the label of tool category. Minor changes to improve stability.